no comments? what the hell. i love these clips. trash tv in 1965? i had no idea this stuff existed. fascinating! I have fond memories of watching Joe Pyne's show when I was a kid....great stuff. Does anyone remember the show where Joe had a guest who discussed the Brotherhood of the Bell? This was long before the Glen Ford movie and it was about a secret, conspiratorial organization like was depicted years later in the movie. Anyone? I loved the Joe Pyne Show. It was more entertaining than anything on tv at the time. In my high school Spanish class we had a required presentation to do in front of the class. I talked the teacher into allowing me and two of my classmates to do a Spanish version of the Joe Pyne Show (She reluctantly agreed!). I even brought in my little sister's toy grand piano to play the theme music. The show was a tremendous hit!!! Joe Pyne was the greatest.. I remeber watching The Fugs on Joe Pyne, and Tullie kept going on the nod, and passing out in his chair. Everytime he nodded out, joe would yell out, "Hey Tullie, you ok, man?" Tullie would wake up and mubble " Yea, man I'm ok" And then pass out 20 seconds latter. All throughout the show. Great Stuff. Look, I barely remember Joe Pyne and couldn't stand his show or his kind of low vulgarity and rude confrontation, which unfortunately has been refined and improved on. But I wish people would stop repeating the hoary old chestnut about Zappa supposedly coming back with the leg/table put-down. There simply is no evidence it ever occurred. As for attempting to establish provenance of the remark by mentioning it can be found in Wikipedia, well, that's just embarrassing. I'm afraid the remark can be found only in the memories of those who denigrate Pyne for his crude political views; and/or those who are eager to attribute evidence of quick wit to the quirky musical genius. I would prefer we respect history and truth a little more and look to our agendas a little less. "As for attempting to establish provenance of the remark by mentioning it can be found in Wikipedia, well, that's just embarrassing." That has less to do with provenance and everything to do with simply quoting what was said over there. 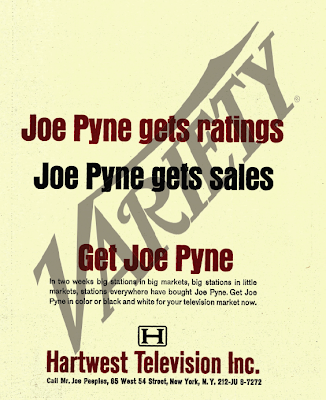 I used to watch the Joe Pyne show regularly. It came on very late at night and was always fascinating. I remember the lady who said she just got back from Venus. Pyne asked her how the weather was up there? She said it was clear and not too hot. As I recall he gave here the typical Pyne reply. "The planet is shrouded in clouds and hot as hell, take a walk!" or something similar. I was disappointed in the comparison to O'Reilly. I don't see any comparison to O'Reilly who is very gentle with most of his guests except Barney Frank. Odd. Only one video was playable; the rest required an invitation. Famous Joe Pyne retort: "Why don't you gargle with razor blades." I watched him in on LA TV, but never knew he had a wooden leg, just a wooden head. He did provide a forum for minority viewpoints, while subjecting them to ridicule. He was a pathetic rightwing scumbag, but at least he didn't pretend to be giving the straight news, as ultraconservative George Putnam did. My mother was a huge fan of Joe Pyne. I remember it came on late Saturday night on KTVU, Channel 2, Oakland-San Francisco. It had unusually theme music, as I recall, discordant xylophone and tympani. Mom wouldn't let me in the living room as she watched it, but I did hear some of it from time to time. I understood why she enjoyed it, her politics were in sync with his. I remember it wasn't on for long, I think KTVU started airing it less than a year before Pyne's death. Looking for any information about an appearance on the Joe Pyne Show in Los Angeles by Nature Boy "Gypsy Boots". Sometime in the 1960's. Does anyone know if there are clips, or transcripts of these appearances? Does anyone remember a bald guy who was a frequent guest (I guess he was good for ratings) who called himself THE MESSIAH? Anyone know who the cat was? He resembled CASSIDY, the older guy who was the drummer in SPIRIT? It may have been him, for all I know. Does anybody remember his show with Marguerite Oswald and Harry Dean around 1964 or 1965? This is when Harry Dean first came out of the closet as an FBI informer. He often had bald caped Anton Szandor LaVey on. LaVey was the self-styled high priest of the First Church of Satan.